The Guardian reports that Egypt is braced for "day of revolution," tweeting that "Democracy activists, Islamists, workers & football fans demand reform." Adam Makary is a producer for Al Jazeera English who says the protesters' demands are "protester's demands: increase in minimum wage, dismissal of interior ministry, removal of emergency law, shorten presidential term" Adam adds that "outside of cairo, jan25 protests will also take place in mahalla, tanta, alexandria, ismalia, sohag, fayoum and mansoura." You can follow him @adamakary on Twitter. The hashtag is #jan25, or try city names, such as #Cairo or #Alex. @Dktr_Sus is live-retweeting, a good person to follow. Our list of English-speaking journalists and citizen reporters on the streets of Cairo and Alexandria is here. 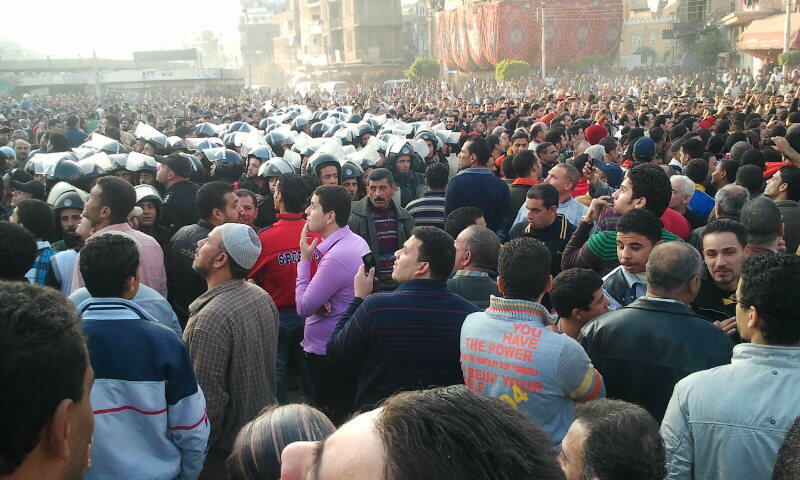 Seems Egyptian security forces/police were unprepared for the size of the protest. Ahram online has great photos and an hour-by-hour summary of events during the protest of Jan. 25. Another problem facing citizen reporters is lack of mobile network access. Alshaheeed suggests "All who live close 2 Tahrir square asked 2 unlock their wifi passwords so public use their internet instead of mobile coverage"
To learn about other techniques for accessing Twitter from Egypt, see the end of this post. I've posted some remarkable videos by citizen journalists here. Find links to Global Voices coverage (more videos, photos, Egyptian blogger reactions) at a page titled Egypt Protests 2011.